I like American Express a lot, I don’t hide that fact. Their customer service is stellar, it’s easy to dispute fraudulent/bogus charges, and the rewards tend to be the best in the industry. Their credit cards also look really cool, and who doesn’t like to look cool? At the same time, a number of American Express credit cards come with some hefty annual fees, which I’m not a fan of. In fact, some of the annual fees are several hundred dollars a year. Take a took at the Amex Platinum Card if you don’t believe me. Eek. 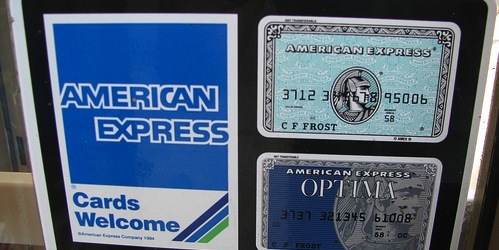 For the record, the Amex Green and Gold credit cards have annual fees as well. I’ve never embraced the idea of paying a fee to use a credit card, it just doesn’t sit well with me. After all, there are plenty of great options out there that are fee-free, so why pay? For most people, the annual fee will never be justified by whatever benefits are offered. Fortunately, even almighty American Express has a number of credit cards with no annual fee, good ones at that. And I carry one of them as my go-to credit card. This revolving credit card from American Express has no annual fee and a 10,000-point opening bonus, which is attractive, though it only earns one point for each dollar spent. This Amex card comes with introductory 0% APR for 12 months on purchases, “no annual fee,” a great cash-back rewards program, and instant approval in under 60 seconds. You get 3% cash back at stand-alone grocery stores, 2% cash back at stand-alone gas stations, 2% at major department stores, and 1% cash back everywhere else, with NO annual fee. Pretty good rewards considering the credit card doesn’t come with an annual fee, eh? For these reasons, it’s my credit card of choice. By the way, American Express also offers a paid version of the card that offers slightly higher cash back percentages. Do the math to see if it will net you more money, with the annual fee factored in. Tip: Apply for the old version of the card and earn 5% cash back on gas, groceries, and at drugstores after spending $6,500 each year. This is the newest American Express card to join the lineup. It’s very similar to Blue Cash, but instead of cash rewards, cardholders receive membership points, which could extend further when used for travel. But I still favor Blue Cash because the cash back tiers are significantly higher. If you want a travel rewards credit with no annual fee from American Express, look no further. The Blue Sky credit card comes with 0% introductory APR for 12 months on purchases, a point-based rewards program, instant approval in less than 60 seconds, and no annual fee! And there are no blackout dates, no travel restrictions, and the points can be used on any airline, hotel, car rental, etc. In fact, you can book travel on any website you want, including popular low-cost comparison sites such as Kayak. This new prepaid credit card has no annual fee, which rivals most of the prepaid credit cards out there that are riddled with all sorts of fees. That’s actually their selling point with this new card, making it a contender in the highly competitive space. This credit card was intended to be an easy-to-use, no-fee-of-any-kind credit card – it features no annual fee, no balance transfer fee, and no late credit card payment fee. This hotel and travel rewards card from American Express features no annual fee and the ability to earn 40,000 HHonors bonus points upon sign-up. Not a bad deal for the frequent traveler. American Express has another prepaid credit card with no annual fee, though this one is aimed at the underbanked youth. It’s got all types of neat features, including the ability to send payments via Facebook. If you’re already a Costco member, you can get a Costco-branded American Express card at no additional cost. Essentially, you get two memberships for the price of one. And you get 1% cash back on Costco purchases! Credit cards with no annual fee don’t have to be lackluster. Take the final credit card on our list. You get 2% cash back on ALL purchases and that money can be invested in a Fidelity account for even bigger returns. So there it is, all the credit cards from American Express that come annual fee-free, the way it should be. Should there be any others, they will be added here as well. Read more: Check out some Amex cards that waive the annual fee the first year. Previous Previous post: What Credit Score Do You Need a Rent an Apartment?